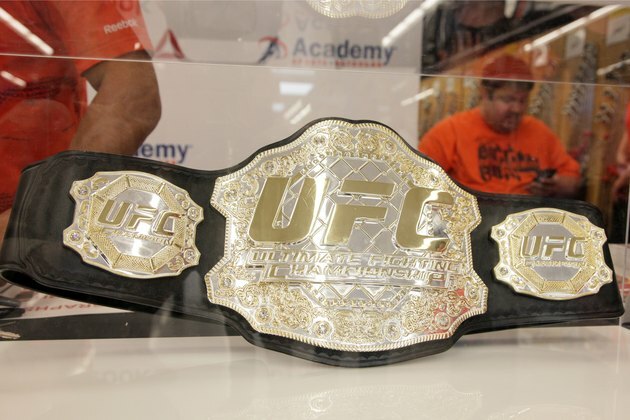 The Ultimate Fighting Championship, known as the UFC, is one of the fastest growing sports in the world. Aspiring fighters often look to emulate UFC fighters in their bid for success. The fitness industry also offers UFC fighter training sessions for people who wish to build strength and fitness, without necessarily engaging in head-to-head combat. Build your endurance with regular interval training. UFC fighters do not build stamina with an extended jog, or cycling for hours. The physical demands of a fight require repeated bursts of intense, explosive energy. UFC fighter Jonny "Bones" Jones builds stamina by performing intense strength work in a circuit training session. To follow Jones' workout, perform 10 dumbbell jump squats, 25 walking dumbbell lunges and 10 dumbbell squats again. To build stamina, perform these exercises one after the other, with a 30-second rest between sets. A training session consists of five different sets, with each set working a separate muscle group. Increase your knockout power with a dedicated strength-training regimen. UFC heavyweight champion Brock Lesnar performs weight training four days a week to build strength and power. To follow Lesnar's workout regimen, focus day one on chest and triceps, and work on back and bicep muscles on day two. Strengthen shoulders on day three, and legs on day four. Use the bench press, triceps dips and hammer curls when weight training. On a typical training day, Lesnar performs six different exercises on the same muscle group. Six to 10 repetitions compose a set, with three or four sets of each exercise performed. Spar on a regular basis to hone your fighting technique and skills. Sparring develops your strength and stamina under cage-fight conditions and trains technical skills. UFC fighter Kenny Florian advises that sparring should strike a balance that allows you to work on technique, without suffering the injuries and damage that can be sustained in a cage fight. Spar with the bag or choose sparring partners who will test you without risk of injury. Choosing sparring partners you enjoy can also increase energy and motivation in a training session. Florian recommends focusing on different techniques on specific days to vary the focus of a sparring session. Fuel your training with proper diet and hydration. UFC fighters require a carbohydrate supply that provides energy during a cage fight. UFC fighter Dan Hardy recommends consuming good fats such as fish oil and coconut oil, and maintaining proper hydration. Good foods to eat before a training session include pasta, baked potato, lean meat and vegetables. Keep yourself hydrated. Hardy drinks 2 liters of water on days off, and that can increase to 6 liters on the day of a match.